Well, it’s been about 13 years since we last saw The Creeper feast on a shirtless high school football team before he fell back into his 23-year slumber again after being captured by Ray Wise. 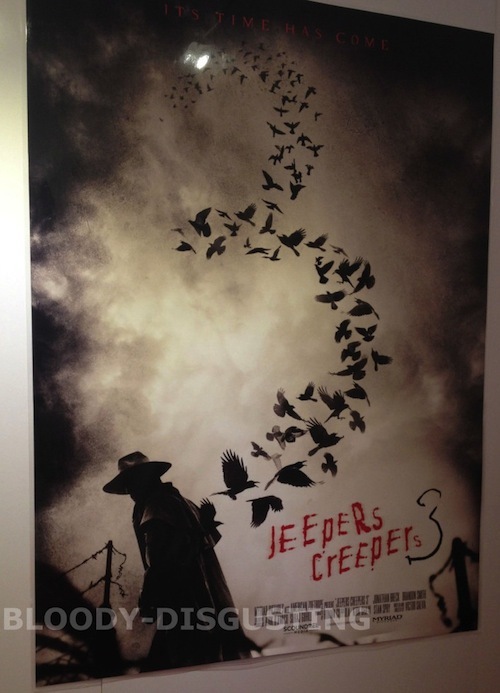 Not many thought we would see another Jeepers Creepers movie. I for one, always loved the folklore revolving around The Creeper and actually thought the franchise had and showed a lot of promise. Now thanks to Bloody Disgusting breaking some news, those who have been fiending for Jeepers Creepers 3 can rejoice! Behold……. Ok. That’s pretty much a perfect poster. So if that’s any indication for what we’ll get with this sequel then count me all the way in. In my opinion, we need a horror movie like Jeepers Creepers 3 right now. It would be a welcome breath of fresh air amidst all of the humdrum possession and found footage movies that are saturating the horror genre right now. A good old fashioned creature flick that hopefully will not succumb to the pressures of using tons of CGI, which is more the norm than not nowadays. For those interested, yes Victor Salva is back as writer/director and Jonathan Breck will be returning to his role as The Creeper. Is it ironic that Victor Salva created a character called The Creeper btw? Anyway – Jeepers Creepers 3 will be starting production in Vancouver soon, so hopefully the poster is a good sign that the wheels will be in motion more quickly than not. I think we all have the same thing on our mind though after hearing the news about Jeepers Creepers 3 though – and that’s whether or not Justin Long’s belly button tattoo will be making a triumphant return.